A big thank you to our Borderstan readers in the Dupont–Logan–U Street area for frequenting our blog this year. Here are your favorites for 2009, the Top 25 Posts on Borderstan based on page views. The number 1 post on Real World DC was the winner by a landslide and it was joined by five more postings on RWDC (and we didn’t really cover it very much at all). Among the other top posts, seven were about crime and/or death (including two about a death at “Men’s Parties”)… three were about restaurants… two were related to arts/entertainment… two were about special events… two covered city services/transportation. The remaining three of top 25? Kal Penn (#5), a dog named Molly (#12) and Ginkgo trees (#20) made the list. “Real World” at 2000 S St NW; a Halo Lounge Angle? The Real World DC: Will They Live in Borderstan? Why Do Ginkgo Tree Berries Smell Like Dog Poo? The Real World DC: 20th & S NW? Four of the eight cast members were at the Real World DC premiere party last night: Ashley, Callie, Emily and Ty. Since the Real Worlders lived in the neighborhood at 20th and S NW and a lot of filming for the 12 episodes was in the area, we wanted to find out what they thought of the Dupont–Logan–U Street area. We hear a great deal about DC’s declining murder rate. It is, indeed, very good news. But here is the ugly reality. The murder rate in New York City is 4.99 homicides per 100,000 people (through Nov. 22 this year). In DC, the homicide rate is 22.77 per 100,000 people (through Dec. 10 this year). So, what is the answer? I don’t know, but I do wish that we (residents and elected officials) would start to ask why and try to figure out what we can do to bring down the rate of violent crime in DC. At the very least, shouldn’t we be asking the question? Yesterday dcist ran a posting on DC’s declining homicide rate, “D.C. To Record Lowest Number of Homicides in 40 Years.” As of now, there have been 67 comments (and some good discussion) on DC’s murder rate and why it is so high (or not, I guess, depending on your perspective what data you might choose to include). Go over and check out the comments. Let the discussion continue. We need some answers. Or, at the very least, we should be asking the question. They’re baaaaaack. 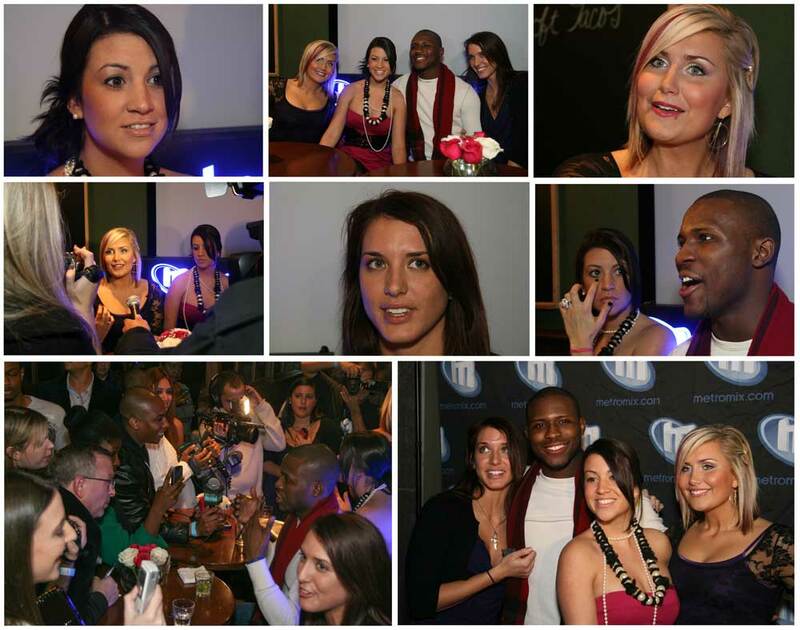 After living at 20th and S over the summer and early fall and showing up at numerous locations in the Dupont–Logan area, four cast members of MTV’s Real World DC are in town this evening for a premiere viewing of the first episode at BlackFinn. Showtime is 10 p.m. with 11 more episodes to follow. According to a publicist, the official events (where we can expect cast members) are the “Real World: DC” Premiere Party followed by the “Real World: DC” VIP After Party. The premiere party is at BlackFinn with doors opening at 8 p.m. at 1620 I Street NW. On Sunday, 3D Inspector Jacob Kishter took over as commander of the 3rd District, replacing George Kucik, who was moved to a “future assignment” at the Forensic Sciences Services Division. As Inspector, Kishter essentially held the number two spot at 3D and was in charge of the Substation in Columbia Heights. Inspector Angel Medina is now commander of the 3D Substation. Kishter came to 3D in June (replacing Inspector Edward Delgado), after having served as the number two officer in MPD’s internal affairs bureau. He has 19 years with MPD. The 3D is the smallest of the city’s seven police districts in area, but the most densely populated. 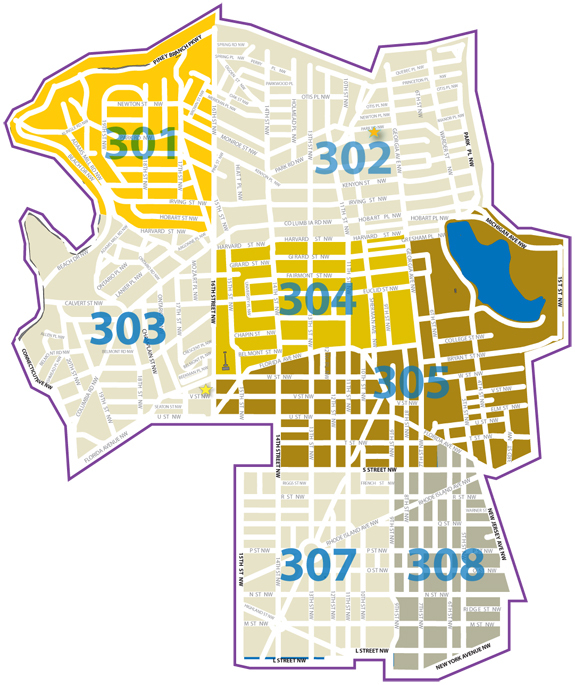 It has seven Police Service Areas (PSAs) and includes a big chunk of Borderstan with 307 (Logan Circle) and 305 (U Street and Howard University). Other PSAs are 303 (Adams Morgan), 301 (Mount Pleasant), 304 (Columbia Heights), 302 (Columbia Heights-Park View) and 308 (Shaw). In addition, PSA 208 (Dupont Circle) used to be called 306 and was part of 3D. The 3D includes all of Ward 1 (Jim Graham) and a chunk of Ward 2 (Jack Evans) with PSAs 307 and 308. It includes many of the city’s wealthy and hipster-gentrified areas, with expensive new condo buildings and a huge amount of new commercial development. It also has public housing projects and pockets of poverty. The district is racially diverse and has new residents interspersed with long-time Washingtonians. In addition, the Logan Circle, U Street, 14th Street and Adams Morgan areas are home to numerous clubs and restaurants that attract people from other neighborhoods and the suburbs. For the year to date (Jan. 1-Dec. 21), the crime stats for 3D show that total crime (violent and property crime) is down 3.5% from last year and the year before. Violent crime is down 13% in two years, while property crime is down less than 1% in two years. Following a pattern we have seen all year, certain types of crimes are actually up when compared to 2008 or 2007. For example, the number of gun crimes is down 8% from two years ago, but is actually up 12% from last year. While the number of robberies has decreased due to fewer robberies without a gun this year, the number of robberies with a gun has increased 16% from last year–from 233 to 271. I saw this posting over at dcist, “Icy Sidewalks of Death Provoke Comments and Questions” with links to some photos at PoP’s “Sidewalks of Shame” (the one of the 14th and T Post Office sidewalk yesterday was particularly galling). In addition, the dcist posting has links to a WaPo story and the City Paper’s Housing Complex, which have info on YOUR legal responsibities for keeping your sidewalk clear of ice and snow. So, are there any stretches of sidewalk in the Dupont-Logan are that you would like to nominate? How about 17th Street? 14th Street? 16th Street? P Street? Others? The 1400 block of P Street is getting a third bank branch with TD Bank joining Wachovia and PNC Bank. TD Bank will open in the Metropole building. The retail spaces in many of the new developments in the Logan–U Street are quite large in comparison to the storefronts in older buildings and converted row houses. One of the few exceptions on the 1400 block of P NW is the small space that houses Pitango Gelato on the same block. The large size of the retail spaces in the new buildings seems to guarantee that we will get banks, furniture stores and larger restaurants instead of a variety of smaller retailers. MPD Chief Cathy Lanier yesterday issued a statement regarding the around-the-world famous snowball fight at 14th and U Streets NW on Saturday. The fame occurred after the snowballers pelted a passing Hummer that was driven by an off-duty DC police detective–who angrily got out of his car to confront the crowd with his gun drawn; a uniformed officer than arrived with his gun drawn. As Chief of Police, I wanted to respond to the many messages received to our police listserv groups last night in reference to the off-duty police officer’s actions on last Saturday. I have reviewed the video clips and heard from the public. It is very obvious to me that the officer pulled his service weapon in response to the snowballs hitting his vehicle. I have no doubt about this, nor has the officer denied the accusations. Let me be very clear in stating that I believe the actions of the officer were totally inappropriate! In no way, should he have handled the situation in this manner. We have taken swift action by placing him on non-contact status until all the facts are gathered and discipline is handed down. Here is the MPD’s news release on the now [truly] famous incident on Saturday involving a snowball fight at 14th and U Streets, an off-duty detective and a uniformed officer. On the corner of 14th and U, each time the light turned red the residents of the West side of 14th Street would attack residents of the East side. In this video, you can hear the crowd roar as the snowplow interrupts the fun momentarily. It wasn’t organized. It was just a bunch of people who happened to be walking by throwing snow at each other. When the light turned red everyone attacked each other. It was a blast. We left before the vigilante cop showed up. Crazy! We saw two interesting snowpersons around Borderstan this evening that you should check out tomorrow. The first, a snowperson named Alan, is in front of Jack’s Restaurant, 17th and Church NW. It’s attracting many visitors (I first saw it on a Facebook friend’s Wall) and has taken on a somewhat shrine-like appearance and quality. I particularly like the accessories–a fruit hat and an umbrella with lights. Alan’s creator is Giovanni, who works at Jack’s; Alan was named for another employee at the restaurant. The very-manly-snowman is on the front plaza of the Scottish Rite Masons temple at the southeast corner of 16th and S Streets NW. No idea on who created this snowman. The broken snow shovel as hat is a nice touch… as are the use of beer cans. This is just… weird? There was an ongoing, friendly snowball fight today at 14th and U NW. Then, according to NBC Channel 7, the fight was joined by antiwar protesters. Around 2:45 or so this afternoon, some of the participants threw snowballs at a passing Hummer SUV. It turns out that the driver of the Hummer was an off-duty police detective who lost his cool, got out of his car and drew his gun. He calmed down after a uniformed MPD officer arrived. NBC Channel 7 reports on the incident, noting that MPD is defending the uniformed officer. It gets convoluted, doesn’t it? This is from Gawker, “Fun with Guns: Viligante DC Cop Dishes Draconian Martial Law for Snowball Fight.” Gawker picked it up from Washington City Paper (with incredible photos) and the ABC affiliate in DC. There are lots of tweets about it, too. I see Mrs. 14th & You come out of semi-retirement (Mr. 14th & You had been running things for a while). Moreover, she came out fighting in her post on the Monday evening crime meeting in Shaw, which featured Councilmember Phil Mendelson (D-At Large). Here you go. Friday morning update: Reports on what actually transpired around 9 p.m. on Wednesday at 1402 S Street NW after a standoff with police have varied. The first report, on the scene, was that after police gained entry to the house they only found a woman living illegally in the house (“squatting”)–but that they did not find the man who had been chased to the house after allegedly breaking into a car on 15th Street NW. This morning we learned from MPD 3rd District Commander Jacob Kishter that police found the car-theft suspect in the house at 1402 S, but no female squatter; Kishter cited the arrested officer. Note: By chance, we on hand for much of the incident described below. We were walking on the 1400-block of S Street around 7:30 p.m. when we saw police in the alley next to 1402 S Street and then heard breaking glass from a rooftop. We were in the area until around 8 p.m. and then returned around 8:30 p.m.
After a 90-minute standoff this evening, DC police apprehended a woman from an unoccupied house at 1402 S Street NW, according to police on the scene. There were approximately 15 police cruisers in the area, along with fire department units (including a ladder truck) and several ambulance vehicles. A police helicopter was also overhead at one point. Police blocked off the 1400-block of S Street and residents in nearby houses were asked to leave.